Awesome job everyone — we were just pushed over the 40% mark for yurt fundraising at Kickstarter! I’m so humbled by everyone’s generosity and the outpouring of support by total strangers too — it’s AMAZING! HUGE blue ribbon to everyone who has pledged their support and if you’re waiting for the right time — now could be it! Thanks so much for spreading the yurt around to your friends too — it means the world to me! And yurts too I should say! I feel like there’s a song in there somewhere…anyways, since the launch of this project I’ve been getting sent photos from friends and strangers around the world of awesome sheep and yurts that I wanted to share! The above is from Mt. 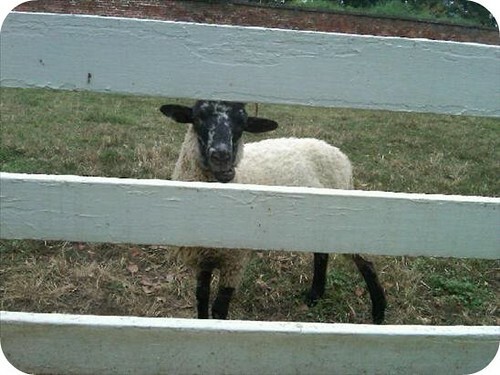 Vernon — they’re George Washington’s sheep! 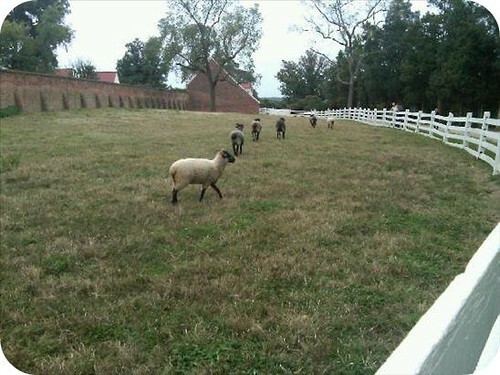 And then they promptly ran away from my friend Courtney! 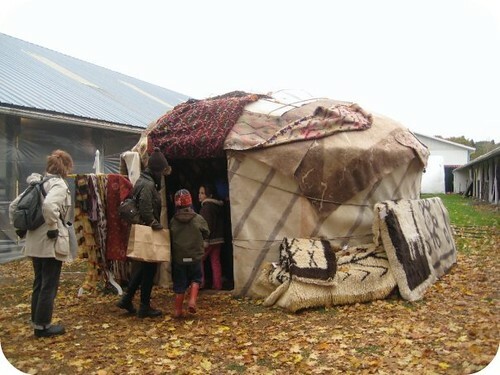 The above is a yurt from the Dutchess County Wool and Sheep Festival from Molly Made! 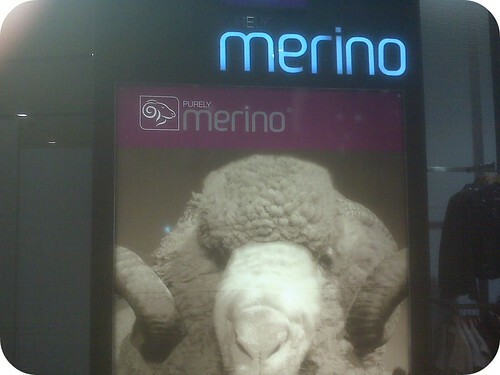 One of my clients sent me this phone pic from his business trip to Australia — look at that beautiful bushy merino! HUGE! Thanks everyone — keep them coming!!! …but keep the old! That was the favorite saying at my elementary school in Back Bay, The Learning Project. From there I went to BB&N and both schools have been so supportive of the yurt I had to post a special thanks! BB&N has posted the Yurt in their Alumni News section — woohoo! Hopefully some of my old school mates will get on board! The LP not only Facebook’ed and Twitter’ed the yurt project but my elementary school principal, Michael McCord also donated to the cause on Kickstarter! It makes me realize that the network I’ve built up over time is so amazingly supportive even 13 years later for the LP! What a great way to continue their original beliefs of community and education and teamwork! Thanks everyone! I’m so thrilled to report that with everyone’s extreme generosity we’ve already raised over $1,100 for the yurt! This puts us at just over 20% funded on Kickstarter — if we keep this up we’ll be able to raise more than enough and the yurt will be even more awesome than I imagined! So team, BIG gold star — please please continue to spread the yurt love! I’m hearing some feedback that people can’t visualize what the yurt will look like when it’s finally complete — totally understandable. When I went to my friend’s new wool importing and knitwear trunk show last Thursday I was expressing this concern to her and she kindly introduced me to her friend Thyra Heder, who is an amazing illustrator. I described the yurt to her and we organized an exchange — a crochet hat for a drawing of the yurt! Posted above is the one that I feel most accurately represents the yurt and can help people get what’s coming when this project is complete — you can see the door and the smoke-hole at the top. So exciting! Dream on…about yurts! Another piece of yurt love to share from Molly Made! Molly is a performer with a yarn habit as well and via friends and family she was introduced to the yurt project yesterday — and boy am I glad! Not only has she brought newfound attention to the Yurt Alert but she’s also fun to talk to about the project — she’s as excited as I am! Molly makes amazing crochet accessories and knitwear — you can find her, if you’re in NYC, at Crafts in Chelsea next weekend! Thanks to Christina DesVaux, founder of the coolest new Uruguian knitwear company, Textura for posting about the yurt today! Yay for kickstarting my project — you guys have raised $475 so far!!! More than I ever could have hoped for!